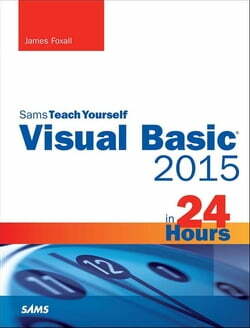 Get Started Now!–24 proven, one-hour lessons In just 24 sessions of one hour or less, you’ll learn how to build complete, reliable, and modern Windows applications with Microsoft® Visual Basic® 2015. Using a straightforward, step-by-step approach, each lesson builds on what you’ve... read more already learned, giving you a strong foundation for success with every aspect of VB 2015 development. Notes present interesting pieces of information. Tips offer advice or teach an easier way to do something. Cautions advise you about potential problems and help you steer clear of disaster. Learn How To Master VB 2015 by building a complete feature-rich application Navigate VB 2015 and discover its new shortcuts Work with objects, collections, and events Build attractive, highly-functional user interfaces Make the most of forms, controls, modules, and procedures Efficiently store data and program databases Make decisions in code Use powerful object-oriented techniques Work with graphics and text files Manipulate filesystems and the Registry Add email support Create efficient modules and reusable procedures Interact effectively with users Write code to preview and print documents Debug with VB 2015’s improved breakpoint features Distribute your software Download all examples and source code presented in this book from informit.com/title/9780672337451 as they become available.